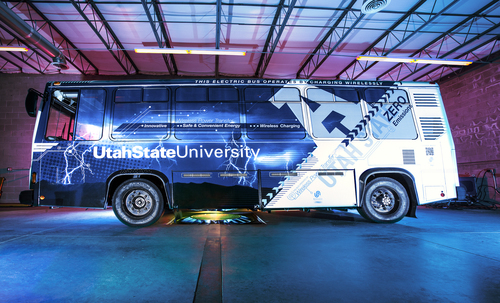 Wireless recharging of electric vehicles has taken a step closer to reality with an all electric 40 foot transit bus being that was demonstrated on Thursday by researchers at Utah State University. The wireless electric vehicle recharging technology was developed by USU's Wireless Power Transfer team, and is being commercialized by WAVE, Inc, a spin-off company from USU. The team has worked on the technology for some time, and July 2011 demonstrated 90 percent electrical transfer efficiency of five kilowatts over an air gap of 10 inches. This is high enough a charge rate for a 4-5 hour recharge time on the electric cars currently on the market. This week's demonstration showed a significant improvement: A power level up to 25 kilowatts, greater than 90 percent efficiency from the power grid to the battery and a maximum misalignment of up to six inches. WAVE, in partnership with the Utah Transit Authority, will launch a commercial demonstration project in mid-2013 on the University of Utah’s campus. It will feature a 40-foot transit bus on a public transit route and an increase in wireless power transfer charging from 25 kilowatts to 50 kilowatts. On electric cars, we call charging rates in the 25-50 kilowatt range by the phrase "fast charging". However, because 40 foot transit bus's require a much larger battery pack than typical electric cars, a 25-50 kilowatt charging rate would be required for normal operation. The high recharge rate means an electric transit bus could cover a longer route with a smaller battery pack. Why? It's because the effective daily driving distance of an electric vehicle is much greater if that vehicle has a fast recharge rate. The reasoning is similar to that of Momentum Dynamics who is also targeting wireless charging for transit buses. A shuttle bus or transit bus follows a fixed route every day, making stops at fixed locations. If wireless charging pads are distributed around the bus route, the bus can be automatically charged wirelessly at each stop along the route. So long as system is designed to automatically kick in as soon as the bus stops over the wireless charging pad, the bus driver can focus on their job of loading and offloading passengers, while the bus focuses on picking up a charge. Wireless electric vehicle recharging systems rely on the physics of "induction" to enables wireless power transfer. Wireless charging systems are more convenient than wired system, because you don't have to remember to plug in to recharge the vehicle. On the other hand wireless charging systems require the driver to park fairly precisely over the charging pad. Experienced electric vehicle drivers often puzzle and scratch their heads over the "inconvenience" of plugging in and recharging their car. Plugging in an electric car is no more inconvenient than plugging in a cell phone for recharging. However there are scenarios where wireless recharging makes a vast difference. As we just noted, transit bus or shuttle bus drivers have a duty to first tend to their passengers and plugging in to recharge at every stop simply would not work out well. Another scenario is car sharing operations with electric cars in the fleet, and the members who aren't very savvy on electric cars.